Warning: Lots of fangirling and some spoilers ahead! I really enjoyed Cinder and Scarlet, but they were both 4 star books for me ultimately. I preferred Cinder to Scarlet because I connected with the characters and romance more, but knocked off a star for how crazy predictable it was. 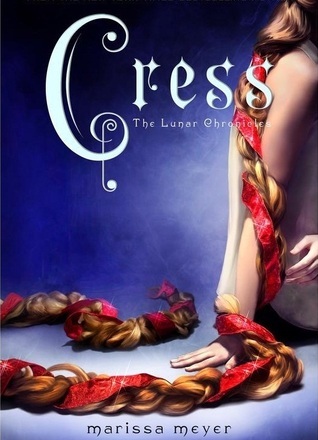 Well, Marissa Meyer has proven herself to be growing as a writer as she managed to surprise me multiple times throughout Cress. I do most of my reading at work during lunch and sometimes breaks, and I rarely react out loud to my reading, but at lunch one day while reading I actually said, “Oh no…!” out loud in complete shock that Dr. Erland is Cress’ father! What?! Did not see that coming! And that was just one of several surprising twists! I wanted to focus largely on the characters, because really and truly, this is Meyer’s greatest strength. How in the world can all these characters be so perfectly unique from each other and well-rounded and likable?! OK, maybe it’s not too terribly unbelievable because I have seen it done before, but very rarely to this scale of a cast of characters or this well. Though I was one of the few who didn’t care for Wolf much in Scarlet (because I never fully trusted him), he really redeemed himself for me in Cress. Scarlet doesn’t get a lot of “screen time” in this book, which I can see would be frustrating for big fans of her, but I feel her part of the story was important and don’t feel any moments with her were wasted. Cinder continues to grow as she comes to accept more responsibilities, and I was always happy to see what Kai thought of his impending marriage and the whole situation. We are also introduced to Jacin, who is a little prickly but has some potential, and Winter, who seems a little whacked-out, but the fact that it’s because she’s not using her powers is very interesting to me. Now let’s talk about Cress and Thorne. So I loved Cress as a character. She’s a lot like Rapunzel in Tangled, which of course makes sense, and I loved seeing how her range of emotions was very similar to Rapunzel’s as she discovered the excitement and dangers of life on Earth. I thought it was so cute how she was quirky and had fantasies about how she and Thorne would fall in love at first sight and go on epic adventures together. She was also quirky enough for someone who had been cooped up in a satellite for so long but not so much that she was completely unrelatable. And then the interactions with Cress and Thorne. SO CUTE. He really seized the opportunity to be just oh-so-Thorne around her, but he was also very mindful of how naive Cress was. Really, the two really needed each other in the desert and through everything they went through, because they could help each other in different ways. And of course they had some great exchanges. Now THORNE. I already loved Thorne from Scarlet, and I was thrilled by just how much of him we got in Cress! And of all the hardships I’ve seen characters go through, something about Meyer making Thorne go blind just really hit me. I just kept thinking, This is essential for his character growth. It’s perfect that he’s dealing with blindness. I think it teaches him to rely on others, as well as his instincts and other strengths. But I’m also really looking forward to his sight (hopefully) being restored so he can look Cress in the eyes again, with a whole new meaning. 🙂 All in all, Thorne is as charming as ever, but he also grows a lot. I am definitely a member of the Thorne fan club. But let us not forget our other couples! Wolf proved to me in this book that he really does love Scarlet, as I alluded to before. And Cinder and Kai, finally! I really only have two complaints about this book, and one of them is why didn’t Cinder tell Kai who she was as soon as she entered his room?! She kept saying, “Trust me, trust me!” and then on the ship he had to drag it out of her. 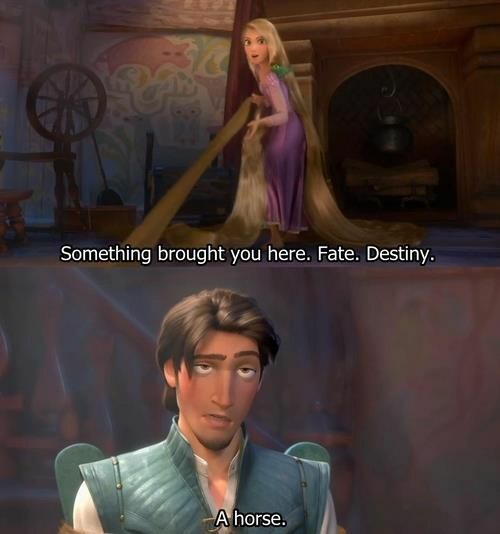 JUST TELL HIM YOU’RE PRINCESS SELENE! He didn’t seem to have a problem believing her, once he decided to believe that she was not using her powers on him, so she should have saved him from being tranquilized! And she really lucked out that Torin was as trusting and accommodating as he was. My other minor complaint may have been a result of how I read it, though it happened more than once so I’m not sure, but I had a problem following the action sequences at times. I would be confused about what exactly was happening and where everyone was placed. But I do seem to struggle with this, so it might have been entirely my lack of comprehension. I was just reading so fast because I wanted to know what happened next! Lastly, I feel I would be remiss if I didn’t mention Iko, who literally made me laugh out loud, once again in public, more than once. She is fabulous. And Dr. Erland! My heart hurt for him so much! Content Advisory: Some violence. Otherwise, squeaky clean! What was your favorite thing about Cress? Who’s your favorite character of the series so far? This entry was posted in Books, Reviews and tagged books, cinder, cress, marissa meyer, reviews, scarlet, the lunar chronicles, YA. Bookmark the permalink. I loved Cress so much too! Thorne really came into his own and Cress was just so sweet! Eek! I know, come on Winter! I loved Cress so much! I agree the characters really stand out in her books – they are so unique and fully fleshed out, and I pretty much love every one of them. (I’m still iffy on Wolf though – he’s so mopey. :D) Thorne is definitely my favorite though – he’s so much fun, and I love that there’s more layers to him in this book. Great review! I’m glad I’m not the only one who doesn’t love Wolf! But yes to Thorne! And yes, all the characters are certainly layered and fully fleshed out! Okay, you have officially convinced me to read this book! I rushed out and bought it when it was released, but I’ve been procrastinating on actually reading it. I’m honestly the most excited for Thorne – I really want to see this development that everyone’s been talking about. Aww thanks! Though I’m not a squealer by nature, Cress brings it out of me! So *squeals* indeed! You hit the nail on the head with Meyer’s knack for characters! I can’t tell you how many times I actually said out loud, “How does she DO it?” while reading Cress, lol! I totally agree with you about Scarlet and Wolf, too. I was kind of surprised by how little of Scarlet was in the book, but I do think her role was very important (especially in regards to Wolf’s role) in this book. I absolutely ADORED Cress and Thorne and their interactions, too! I have to say, I was COMPLETELY shocked that Thorne went — and stayed — blind! I do think it was essential not only to the story, but also to his character growth. She is SO GOOD at this! Also: Iko is the best. Oh my god, she is hilarious and I LOVE the way Thorne just embraced/indulged her in this book, too! I think one of my favorite scenes in the whole book was when Kai and Cinder are finally talking on the ship and Iko interrupts, lol!! Ha ha, that part was great! Oh Iko! But yes, I’m really excited to see everyone continues to grow in Winter! Thanks so much for thinking of me! I’ve won this award before so I won’t do another special post about it, but I really appreciate it! What didn’t I love about Cress!? I mean, Thorne totally stole the show for me (and I so agree about his similarities to Han Solo!! ), but it was his particular charisma coupled with Cress’ naiveté that really got me grinning. As for why Cinder didn’t tell Kai…I would guess it was because she knew he didn’t trust her (he thought she was using Lunar mind tricks on him! ), and wanted him to believe that she had never manipulated him before dropping such a bomb. But that’s just a guess! I guess that’s true, that she would want to make sure he trusted her first. Otherwise he would have just thought she was saying that. It would have been nice to at least know she thought that though!